As part of the Presidential Visits Series (The Presidential Visits Series in its entirety: James Monroe to Donald Trump), Michael Nighan has written on presidential assassins who have visited or passed through Rochester. He recounted John Wilkes Booth’s performances at the Metropolitan Theatre in 1861 and when the train carrying Leo Czolgosz to his execution stopped in Rochester in 1901. 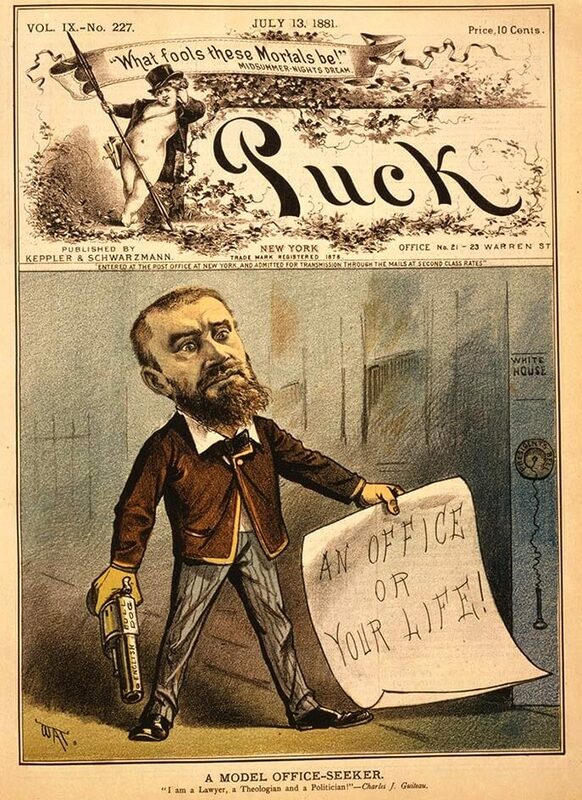 Today, he looks at Charlie Guiteau who assassinated President James Garfield in 1881. 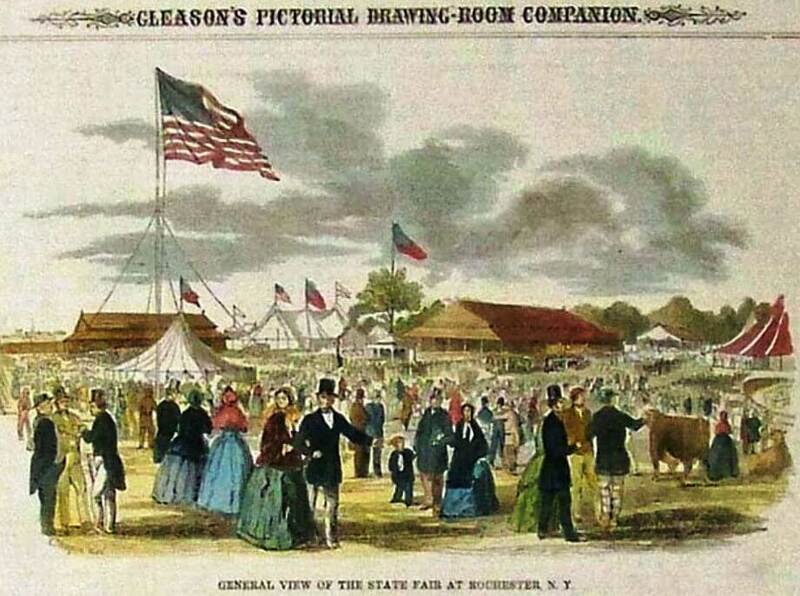 Because of the crowds of spectators that the fair attracted, it naturally also attracted people looking to sell something to those crowds, be it food, drink, entertainment, souvenirs, or even salvation. 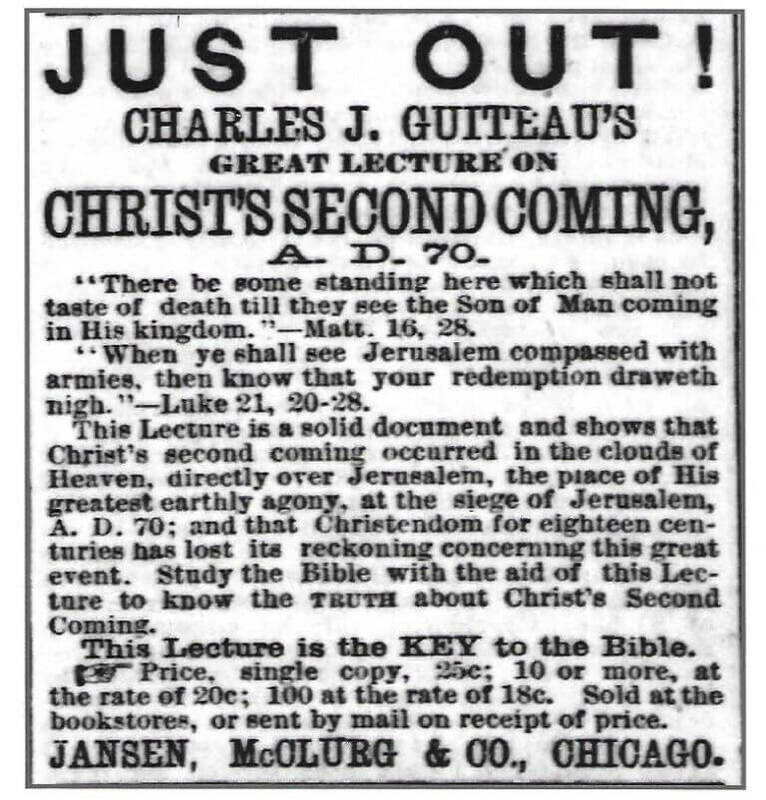 So it wasn’t surprising that in 1877 one such “vendor”, Charles Julius Guiteau, failed lawyer, failed preacher, failed politician, and soon-to-be successful presidential assassin, arrived in Rochester to lecture the après’-fair crowds on his particular brand of religion. Charlie was, to put it mildly, screwy, a loony, a flake. Even screwier, loonier, and more flaky than Lincoln’s assassin, John Wilkes Booth or Leon Czolgosz, McKinley’s assassin. Charlie was born in Illinois in 1841. His mother (a constant sufferer from “brain fever” and considered by her neighbors to be only tenuously in touch with reality) died when he was seven leaving him to be raised by a despotic father who believed that the occasional sound thrashing would cure Charlie of a tendency to stutter. Charlie tried to enroll in the University of Michigan at Ann Arbor, only to repeatedly fail the entrance examination. He then “got religion” and moved to central New York to join the utopian religious sect known as the Oneida Community. There he became a devout follower of John Humphrey Noyes, the cultish leader of the community who preached “Bible communism” and taught that spiritual perfection could be achieved through prayer, group criticism sessions, and a reform of the relationship between men and women via “complex marriage”, later known as “free love” and group marriage. Yet even with the community’s open sexual mores, it seems that Charlie was markedly unsuccessful in establishing a connection with any of the female members, so unsuccessful (and apparently so obnoxious) in fact that he was nicknamed “Charles Gitout”. Disgruntled by the lack of “free love”, constantly complaining about being a prime target at the group criticism sessions, and insulted by having to obey the rule that required all members to perform manual and menial labor, Charlie sent Noyes a letter arguing that he should be given preferential treated better he’d been sent to Oneida by God. Rebuffed in this appeal, after five years at Oneida Charlie left the community, returned a few months later, stayed another year, and finally left for good, apparently to everyone’s mutual satisfaction. The satisfaction was short-lived when Charlie filed a lawsuit against Noyes, demanding $9,000 for his six years of labor at Oneida. The suit was laughed out of court. Charlie then started sending letters to newspapers, ministers, state legislators, and the Attorney General in Washington, demanding their help in suppressing the Oneida movement. Not knowing what else to do, Charlie decided he should become a lawyer. Freeloading off relatives in Chicago, he clerked in a law office, took the bar exam (which consisted of three questions. He got two right), and became a bone-fide attorney-at-law. But his legal career never got off the ground as he was unable to obtain clients for anything more challenging than debt collection, where he had a bad habit of embezzling what money he did collect. By 1875, having married and then abandoned a wife (she took exception to Charlie locking her in closets and incessantly yelling, “I am your master! 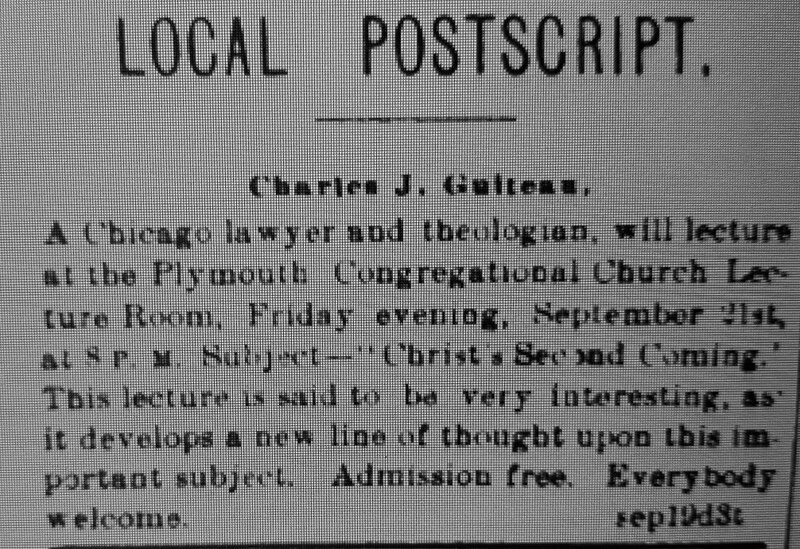 Submit yourself to me!”), with his father telling everyone that his son had been possessed by Satan, and finally after skulking out of Chicago when his sister instituted proceedings to have him committed to an insane asylum, Charlie had become convinced that he’d been hand-picked by God to be a later-day St. Paul, preaching a new gospel of salvation. To aid in his proselytizing, Charlie published, “The Truth: A Companion to the Bible”, the truth being that the book’s contents were plagiarized from the writings of John Humphrey Noyes. Another truth being that Charlie, usually unable to pay after having a few copies of the book printed, usually had to steal them from the printer to sell. (Question): Why do you think so? (Guiteau): From the genial way in which he received me. I was well advertised in the newspapers and got my handbills out as usual, and I had a very fair house. I had three or four hundred people, I guess, (NOTE: Doubtless a vastly inflated number), and they were very attentive, although some of them pricked up their ears and did not believe that kind of doctrine and laughed, etc. Failing as an evangelist, in 1880 Charlie gave up trying to win souls and turned to trying to win elections. Now imagining himself to be a first class politician, he wrote a rambling and semi-incoherent pamphlet backing the “Stalwart” wing of the Republican Party which was supporting Ulysses Grant’s unprecedented bid for a third term. Sailing from Boston to New York to offer his services to the Republican National Committee, Charlie was on the deck of the steamer the S.S. Stonington when it was rammed by another ship, killing 80 people. Though standing near the point of collision, Charlie was miraculously spared injury, confirming in his mind that he was indeed being protected by God to help the Republicans win the White House. When Grant was denied the Republican nomination, which went to James Garfield, Charlie simply substituted Garfield’s name for Grant’s on his pamphlet and turned it into a speech. Spending most days at Republican headquarters, he pestered party leaders for a chance to deliver it. Finally given an opportunity, Charlie stood before a crowd of about two dozen spectators who rapidly lost interest as he made a less-then-impressive presentation. After Garfield’s narrow defeat of Winfield Scott Hancock, his Democratic opponent for the presidency, Charlie became convinced that his speech had been the key to victory. Seeking a reward for services rendered, he wrote the president-elect asking to be appointed to a diplomatic post. He first requested to be made the American minister in Austria, and then later US consul general in Paris. None of his letters were answered. Infuriated by this lack of response, Charlie moved to Washington in early 1881 to handle matters in person, living in boarding houses and cheap hotels where every few days he skipped out without paying the rent. 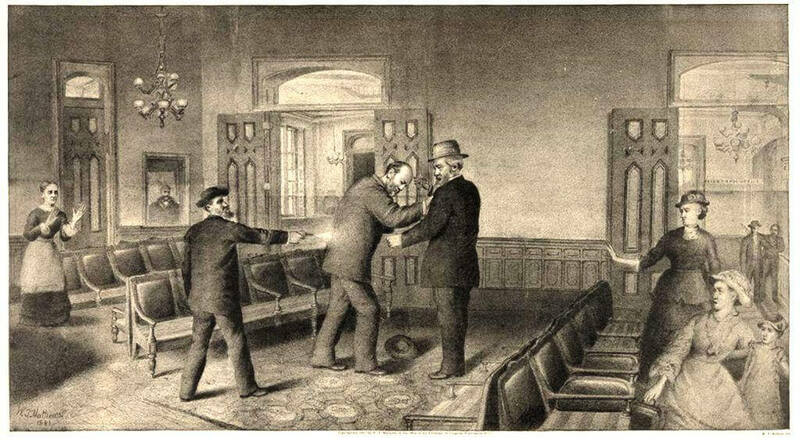 Seeing Garfield enter the station accompanied by his two sons and by Secretary Blaine but without any police protection (despite the assassination of Abraham Lincoln just 16 years before) Charlie walked up behind the president and shot him twice in the back at point- blank range. Garfield cried, “My God, what is that?”, and collapsed into Blaine’s arms. One bullet grazed the President’s shoulder, and the other struck him in the back near his lower intestines. Charlie, trying to run from the station, collided with a patrolman who’d heard the shots. Surrendering to the police and thrown into a DC jail, he exclaimed, “I am a Stalwart of the Stalwarts! I did it and I want to be arrested! Arthur is President now!” This statement cast an undeserved shadow over Vice President, Chester A. Arthur, by making it appear that he had been involved in the assassination. Lying on the filthy floor of the train station, and later at the White House where he was taken for treatment, Garfield had to endure the ministrations of over a dozen doctors who, despite the development years earlier of the practice of antiseptic surgery by Dr. Joseph Lister, probed his back wound with unwashed hands and dirty instruments looking for the bullet, actions which ultimately resulted in Garfield developing massive internal infections. Suffering in the extreme heat of a Washington summer, Garfield received some comfort when an early form of air conditioning was developed by government engineers who set up fans to blow air over large blocks of ice. Even Alexander Graham Bell, who used his knowledge of electricity to build a crude metal detector, was called in to join the hunt for the missing slug. Sadly for Garfield, although it was later shown that the device could have located the bullet, his doctors were convinced that it was lodged in his right side, and Bell never checked his left side, which is where the bullet actually rested. As the infections continued to weaken Garfield, and his intestinal wound make it difficult for him to digest food, he lost over 60 lbs in two months. In early September Garfield was taken to the Jersey shore via a specially built rail road spur to escape the Washington heat. But to no avail. He died of an aneurysm, blood poisoning and bronchial pneumonia on September 19. Apparently hoping to ingratiate himself with the new president, Charlie wrote Chester Arthur a letter saying; “I presume you appreciate [my act]…It raises you from $8,000 to $50,000 a year [and from] a political cipher to President of the United States with all its powers and honors.” Charlie also anticipated public applause for his act following the publication in the New York Herald of his authorized autobiography. An autobiography that including both a personal ad where Charlie was looking for a wife, “an elegant Christian lady of wealth, under thirty, belonging to a first-class family”, and also a notice that he would be running for president. Concern about a lynch mob, the police had Charlie moved to an internal cell at the jail, with only a small opening in a bullet proof door, a move rendered somewhat superfluous when a prison guard took a shot at him. 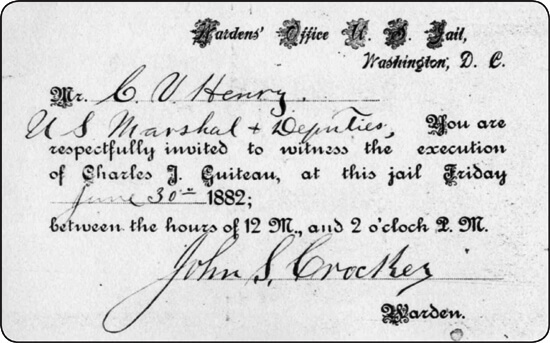 The case of United States vs. Charles J. Guiteau began in October. George Scoville, Charlie’s brother-in-law appeared as defense counsel and advised the court that he intended to argue that 1) Charlie was legally insane, and 2) Garfield’s death was caused by medical incompetence, not Charlie’s bullet. Trial was set for November. In 1881 an insanity defense for murder was an uphill legal battle given that prosecutors need only show that the accused knew that his act was illegal and that he understood the consequences of his act. Both points of which Charlie had already freely admitted. 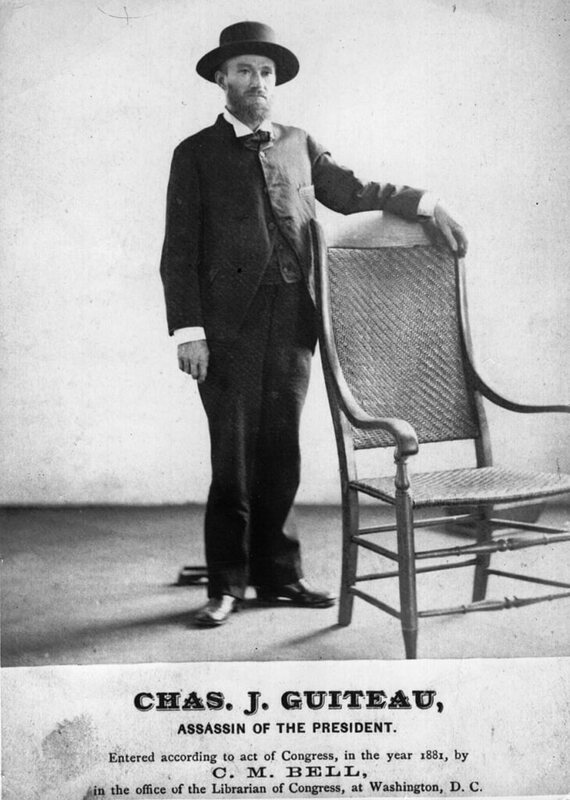 The most macabre prosecution testimony came from a Dr. Bliss who exhibited two of Garfield’s vertebrae, which had been pierced by the bullet and subsequently removed during his autopsy, as a visual aid to demonstrate the path of the bullet. As Charlie was driven back to jail after Bliss’s testimony, a drunk on horseback galloped up to the police van and fired a pistol at him, tearing his coat but leaving him unharmed. Subsequent government witnesses testified that Charlie could not be insane because there were no liaisons on his brain, an assumed characteristic of insanity at the time. Charlie finally took the stand on November 28. Recounting his experiences at the Oneida Community, his days as a traveling preacher, and his final career as a politician, He explained why he believed that God had called upon him to save the country and the Republican Party by shooting Garfield and elevating Arthur to the presidency. He stressed that his survival from a ship wreck and two attempts on his life were proof of his claim that he was doing the Lord’s work. Following the summations, the jury deliberated for an hour and five minutes. Not surprisingly, the verdict was “Guilty”. Charlie was sentenced to be hung on June 30. The Supreme Court upheld his conviction, and an appeal to President Arthur for a pardon, which had been signed by 160 doctors who believed Charlie to be insane, was subsequently turned down, to no one’s surprise except Charlie’s. Viewing his hanging as an opportunity to further educate the public, Charlie was, with greatest reluctance on his part, dissuaded from appearing on the scaffold in his underwear in an attempt to compare his execution to Christ’s. Twenty thousand people requested tickets to witness the execution. Two hundred and fifty tickets were issued. Then the executioner sprung the trap door and poor (unofficially) crazy Charlie Guiteau dropped to his death. Outside the jail, a crowd of over a thousand spectators cheered the news that he had truly gone to the Lordy. Today, the medical consensus is that it was in fact the infection caused by the doctors, not Charlie’s bullet, which had killed Garfield. GUITEAU Goes Up Today And the Prices at FITZGERALD’S GO DOWN. Both the Above Meet with Popular Favor. 1. 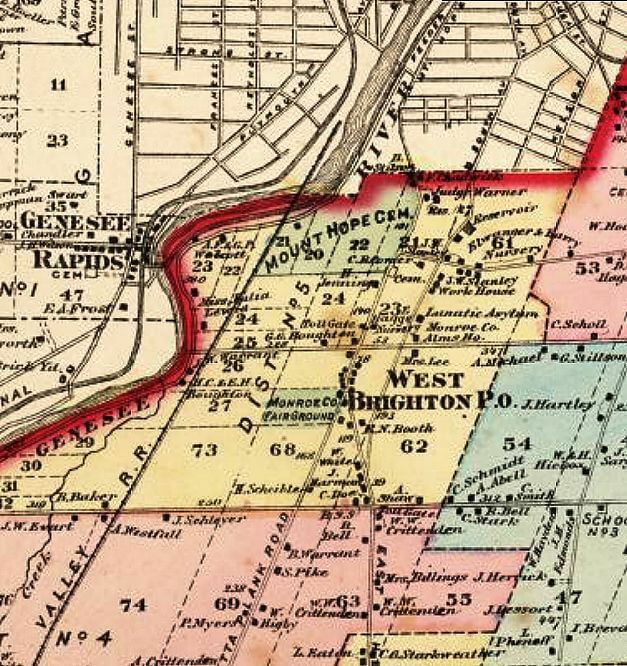 Actually, to make it more confusing, the fair grounds were located in what was then part of Brighton, south of Mt. Hope Cemetery off West Henrietta Road, on land that was later annexed by the City of Rochester. 3. Prescient words. Following his execution and autopsy, Charlie’s brain, skull and other bits and pieces were preserved for “research” into what made him tick. 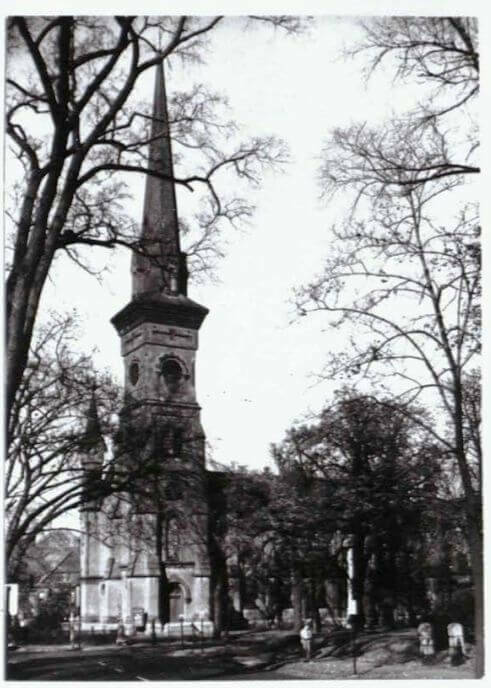 On the day of Charlie’s execution the Rochester Union and Advertiser referenced this rather grisly procedure, “The demonstration of his sanity or insanity by a post-mortem examination of his brain will be made, or attempted, by a commission of competent medical examiners and scientists.” Charlie’s pickled brain is now on permanent loan to the Mütter Museum of the College of Physicians in Philadelphia where it’s exhibited in a glass jar. The segment of Garfield’s spine introduced in court is likewise on display to the public, at the National Museum of Health and Medicine outside Washington, DC. 4. In his black comedy musical, “Assassins”, Stephen Sondheim has Charlie singing and tap dancing his way up the gallows steps to eternity.